Gazal Corporation Limited, the licensor of business shirt brand Van Heusen brand in Australia and New Zealand, has launched an integrated advertising, digital media, in-store and publicity campaign. The campaign is for the brand’s latest range of business apparel, Move. 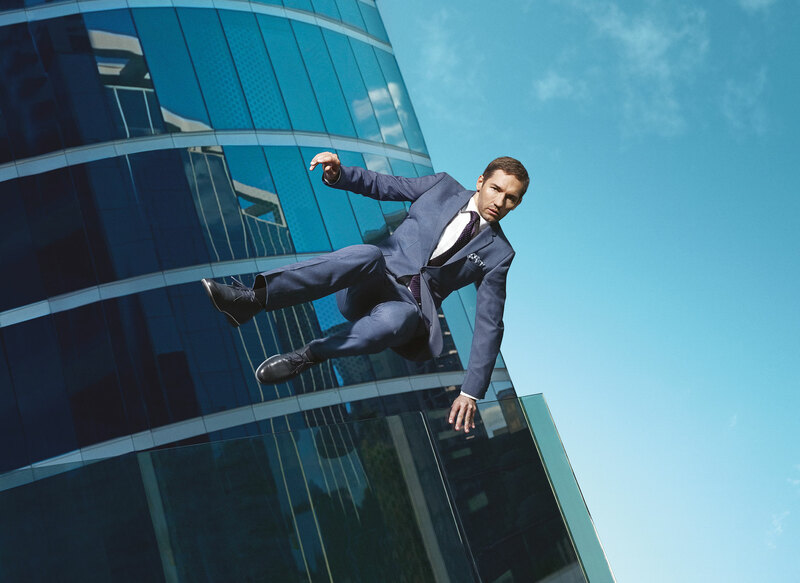 The video content piece and a series of print stills feature Hollywood stuntman, director and actor Nash Edgerton scaling, falling and leaping from city buildings – demonstrating the flexibility and testing the extreme limits of the Van Heusen Move collection. Los Angeles-based Edgerton has performed stunt-work in over 150 films, including Hollywood blockbusters such as The Matrix trilogy, Star Wars II and III, The Thin Red Line and Superman Returns. The campaign will feature across out-of-home, digital platforms, print and social media channels from 18 August 2014. Creative and strategic agency, Bashful, devised the strategy around the campaign and Stellar Concepts will execute the public relations. The Van Heusen Move campaign was shot in Sydney by fashion photographer Chris Searl and styled by Australian fashion authority Dave Bonney. “We approached the campaign with the idea of testing the limits of Van Heusen Move. The campaign shots show an extreme product demonstration that underlines the freedom of movement of the collection,” says Bashful creative director Emil Vrisakis. The Van Heusen Move collection is designed in Australia and will be available starting 18 August 2014 in Myer (Australia), Farmers (New Zealand) and online.